Did you know that most types of dental-related diseases can be avoided? 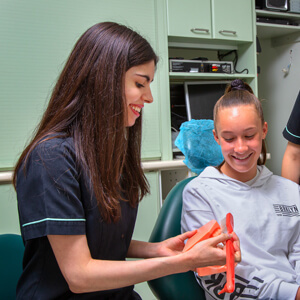 At Vision Dental, our Menai family dentist believes in providing education and preventative services that help you reduce the risk of oral health problems in the future. Healthy teeth and gums depend on a lifelong commitment to great oral hygiene and care from an understanding dentist. Dr Stephen Suster (Dentist) is happy to oblige by providing essential preventative services for patients of all ages, including routine checkups and hygiene care. One of the most important goals of your scale and clean visits is to combat gum disease. Periodontitis (gum disease) causes inflamed tissues that lead to tooth and bone loss; early care is extremely important. It’s also directly linked with serious medical conditions that can impact your overall health. Even if you brush and floss daily, small amounts of biofilm can collect and build up deep under the gums without regular professional cleanings that contribute to the infection. During your visit with us, Dr Suster will perform a routine or comprehensive exam to assess any changes or concerns in your dental health. Utilising diagnostic X-rays, we are able to pinpoint concerns that may be simpler to treat now rather than later. We’ll work with you to address your concerns, needs and future smile goals. As part of your checkup, we will also inspect the gums, soft tissues for signs of precancerous tissues, bone levels, joints and muscles surrounding the mouth. Our Menai dentist also offers a variety of mouthguards, children’s dentistry and sleep apnoea services. We recommend scheduling your checkup every six months, so that problems can be assessed in their earliest stages. If you’re due for a checkup and clean, contact us today. Vision Dental in Menai is always happy to see new patients. Be sure to ask how our orthodontic options can help you improve your oral hygiene! We’re open late.